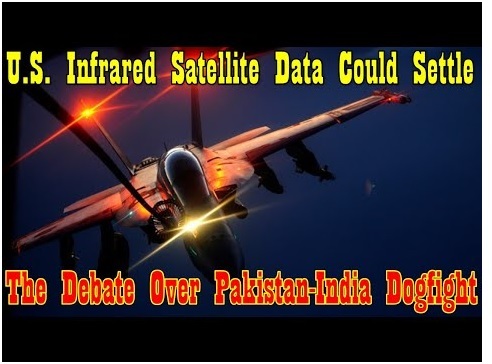 ﻿ U.S. Infrared Satellite Data Could Settle The Debate Over Pakistan-India Dogfight. U.S. Infrared Satellite Data Could Settle The Debate Over Pakistan-India Dogfight. We have covered the story in extreme depth and tried to separate myth from reality and knowns from unknowns as much as possible in an attempt to bring an objective and well-versed viewpoint to the alarmingly murky and spiteful debate. But even a month and a half after the aerial engagement happened, what exactly occurred during it remains unclear. India says their MiG-21 pilot that got shot down also shot down a fighter of his own—a Pakistani F-16—moments before his aircraft was struck. Meanwhile, Pakistan claims they lost no aircraft during the engagement and reports attributed to undisclosed sources state that all of its F-16s are accounted for.